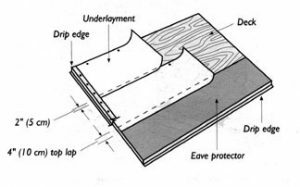 Eave protection consists of 2 plies of tar paper or 1 layer of SBS modified fibreglass base sheet or 1 layer of self-sealing ice and snow membrane on the bottom of the roof. This would extend from the bottom of the roof a minimum of 12 inches past the exterior wall. On most houses this would be approximately 3 ft. This is the part of your house where most of the heat escapes from the house’s outer wall, causing ice-damming. So that is why this area gets extra protection. 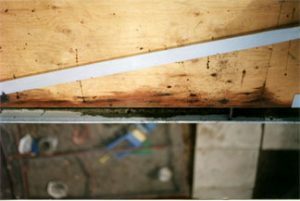 At Sunik, we prefer to use either the SBS modified fibreglass base sheet or the self-sealing ice and snow membrane depending on the customer’s decision. WHAT IS UNDERLAY, AND DO I NEED IT? Underlay is a layer of #15lb tar paper (felt) or a layer of synthetic plastic underlay that covers the entire roof, from the point where the eave protection ends to the termination point at the ridge line or wall. Yes, you need to have underlay for a proper installation. 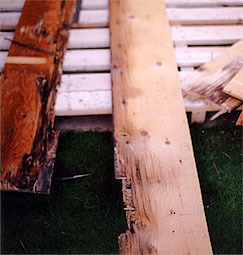 Shingles are tested by the CSA with underlay in place. Additionally, it is recommended by manufacturers and you may void part of your warranty if you don’t use it. Shingle underlay is a second line of defence in the event of a shingle blow up, windblown rain under the lap of a shingle and weather protection during shingle installation. CAN I JUST SHINGLE OVER THE OLD SHINGLES? No. The only way to ensure a good surface for fasteners is to strip the old shingles off down to the deck. 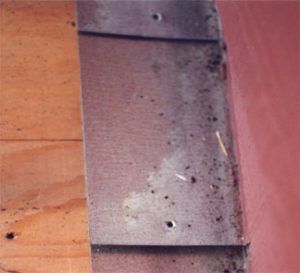 If you don’t remove the old shingles, you might be covering up wood rot. 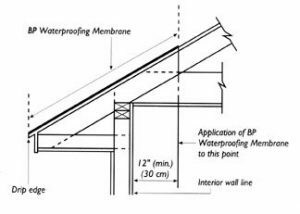 The drip edge protects your deck from rot by diverting water into your eavestrough. It is a band of metal fastened to the deck at the eaves. Our image shows what happens to the edges of a roof that does not have a drip edge. The wood will need to be replaced. CAN I EXPECT WOOD ROT, AND WHAT WILL IT COST? The age of your house and whether it was shingled properly are important factors in determining if you should be concerned about wood rot. In most cases, rotting occurs in the bottom 12” of your roof. It’s difficult to assess the damage without removing shingles. A good contractor like Sunik Roofing will let you know prior to an inspection if he expects to find rot and how much it will cost to replace it. 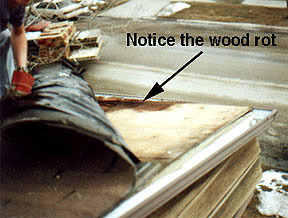 We’ve included an image of wood rot that all happened at the bottom edge of the roof. It might have been avoided if a drip edge were in place. The melting and freezing of snow on your roof can result in the formation of an ice dam. This situation occurs as snow melts and travels down the roof and then freezes up again, causing a ridge or dam of ice. After the ice dam is established, it holds back water each time a melt occurs, which can lead to a back-up under your shingles and potentially a leak. This is another reason why an underlay is important. WHAT KIND OF VALLEYS SHOULD I USE? Manufacturers and installers have their own preferences on the proper way to shingle a valley. There are many methods used. In almost all situations, Sunik uses the open valley method: 1 layer of 36” eave protection run up the centre of the valley and a layer of 24” pre-painted sheet metal installed over the top. The shingles are then lapped overtop of the valley metal but cut back from the centre to allow for water flow. 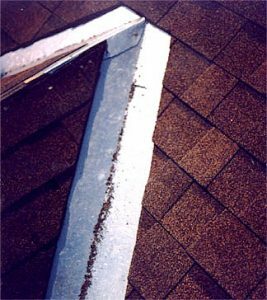 Water drains from the valley area quickly with this method and ensures that water does not get trapped between plies of shingles, creating an air pocket as it tries to evaporate. This causes the shingles in the valley to blister and age prematurely. Galvanized metal is shown in our photo to make it easy to see, however, we generally use pre-painted metal to match the shingles for a more uniform look. CAN I REUSE WALL AND STEP FLASHING? On a re-roof, we generally try to save the old wall and step flashings as they are pinned in behind your siding or stucco. 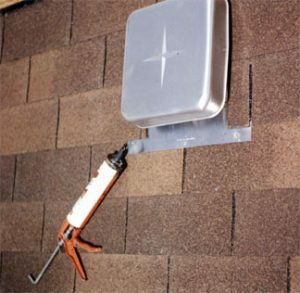 Each piece of flashing is inspected and replaced carefully if it is deemed that the flashing cannot be used. Shingle underlay is run up in behind the wall, and step flashings and all old nail holes have sealant applied to them. WHAT SHOULD I KNOW ABOUT AIR VENTING? Air venting is critical to your home and the proper installation of your roof. Your manufacturer’s warranty may become void without proper venting. You may also experience condensation leaks and a shortened lifespan of your roof. You should turn to installers like Sunik Roofing in Calgary who fully understand air flow and the manufacturer’s specifications. WHAT SHOULD I EXPECT AFTER THE JOB? You should expect a full clean-up and final inspection upon completion to ensure that all workmanship was completed according to standards. Sunik Roofing recommends that you get all written guarantees for labour and materials before work begins.